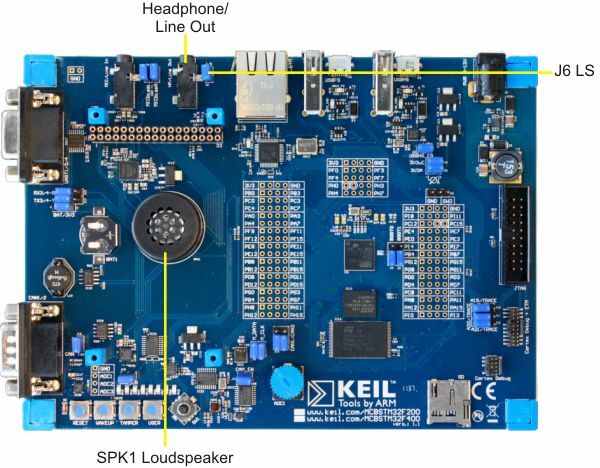 The MCBSTM32F200 board includes a speaker controlled by the low power stereo CODEC amplifier (IC6). Jumper J6 (LS) controls loudspeaker (SPK1) and headphone/line output jack (HP/Line Out) from the CODEC amplifier. Installing Jumper J6 enables the headphone jack and disables the speaker. Removing Jumper J6 disables the headphone jack and enables the speaker.